Final Week for Long Beach Municipal Band this Summer! This is the final week for catching one of several free concerts in the park by the Long Beach Municipal Band! T (in the center of the background there) says go climb a tree and catch a free concert this summer at your local park! Here in Long Beach (CA), we have several locations to choose from, including this venue near Marine Stadium. I’ve blogged a few times before about the band and our good times going to the shows throughout the years (you can click here for those posts). But what I’ve not shown you is a history of T’s attendance at the concerts each season! I’ll do that now with a few photos below. This is a 9-month-old T in summer 2008 at the concert in the park. I think we put the napkin on his head because of the sun. We must have gotten there early that day! And I miss that little shirt of his (it says “I’m Da” with a picture of a fused cannonball). T gets down and dirty at the summer concert in 2009 (1-1/2-years-old in this photo). Whatever was I thinking putting him in white pants?! How appropriate that the outfit I had to change T after the mud dive included this “Mr. Messy” T-shirt (another shirt I totally miss). T was so excited about “snack dinner” during the concert he attended in 2011 (3-1/2-years-old here). An excited, 4-1/2-year-old T is all amp’ed up for the concert in the park (summer 2012). T settles in for dinner pre-concert a couple of weeks ago at the Marine Stadium concert in the park. Since he’s older now, he can leave out immediate area to play with friends in the park nearby. The deal though is he has to eat something first and check in with us every now and then (and allow us to check on him, too). Looks like we have a deal, T. Have fun playing in the park with the other kids while Moms and Dads enjoy their “date nights” with friends new and old! As you can see, these concerts are for all-ages: Kids, no kids, large groups, or couples. You basically bring a blanket (or put one down earlier in the day to save yourselves a space up front with friends if you have a large group like we tend to be a part of), some chairs, a picnic basket with all the trimmings, some drinks of all kinds (though officially there’s no alcohol in the public parks, RMT’ers), and plan to settle in for an evening of live music under a beautiful summer sky. Honestly, this is one of our favorite seasonal activities that Long Beach has to offer. Our family prefers the Marine Stadium venue on Thursdays, but there are various parks all over Long Beach that host the concerts. The Long Beach Municipal Band performs free concerts at Marine Stadium-Marina Vista Park for a few Thursdays each summer here in Long Beach (CA). There’s nothing like taking in a free concert in the park on a summer evening, RMT’ers! PS – There’s usually a bonus concert lineup at select locations the following week by the Elm Street Band (AKA, the band that T’s swim teacher is a member of). It looks like this year those performances are Thursday August 8 at Marine Stadium and Friday August 9 at El Dorado Park West, both from 6-to-8 p.m. For that and other Elm Street Band event information, please click here. So pack a picnic, get out there, and enjoy the show(s), RMT’ers! Bravo… and cheers! 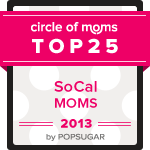 Thank you to everyone who voted for “Real Mom Time” in the 2013 Circle of Moms Top 25 So Cal Mom Blogger contest! I am here to say that I ended the contest with an official ranking of… #17 (two-way tie)!! WOW! And that’s all thanks to you, RMT’ers, whether you voted just one time, voted daily, and/or shared the contest links with others. I’ll update you again when I hear anything more from the Circle of Moms folks about what this ranking means for me… and for you, too! Posted in Entertainment, Free	| Tagged 2013, band, bob hirschhorn, california, concert, concert in the park, el dorado, el dorado park west, elm street band, free, long beach, Long Beach Municipal Band, los cerritos, marina vista, marine stadium, municipal, park, parks, parks and rec, schedule | Comments Off on Final Week for Long Beach Municipal Band this Summer!